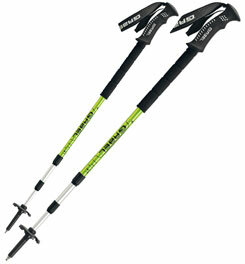 Gabel Tour Lite Lime Trekking poles have a great weight to length ratio along with other high end features. 3-section, 7075 T651 Series heat-treated Aluminum shafts have diameters of 16/14/12mm.They adjust from 66-142cm (26"-57") for a compact pack size. Top Click System allows you to easily adjust and/or remove wrist straps. Extended foam grip. 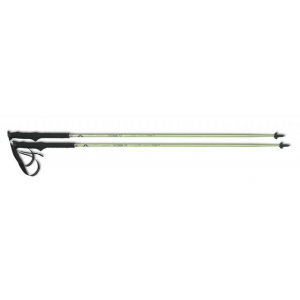 Two different locking mechanisms are used on these poles. 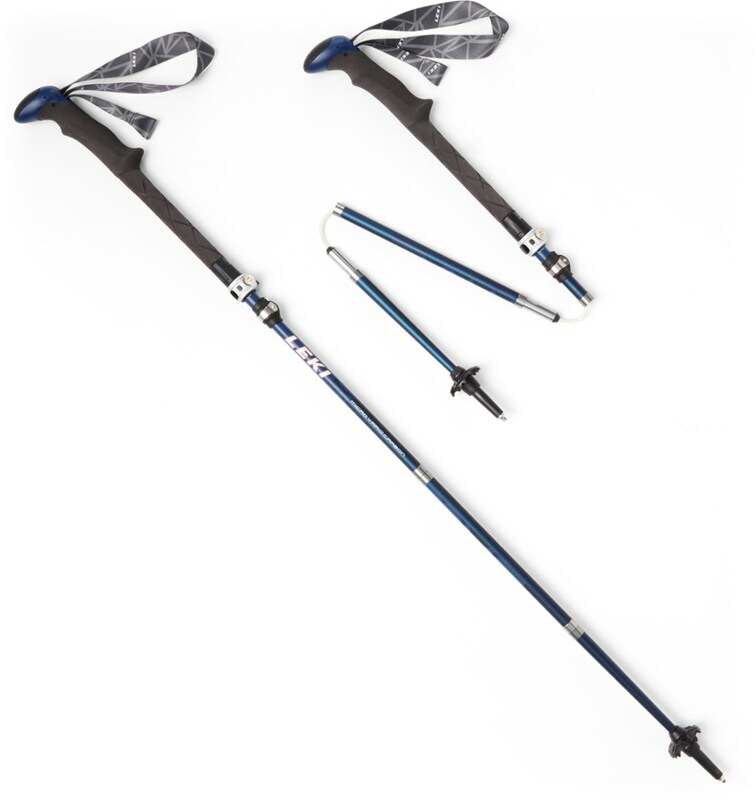 The middle section (14mm) uses the Top Locking System with a metal shaft for strength and the bottom section (12mm) utilizes the Easy Extra Locking System for weight savings and easy adjustment.The carbide flextips are replaceable and offer the most secure hold on any terrain and surface. Color: Lime Green. Pack Length 26". Weight 17.3 oz. per pair. Made in Italy. Pro Duel Gummy Top Click System Grips: a rapid release system for simple and secure strap adjustment that also allows for easy strap release. With T.C.S., in just a few seconds integrated TCS straps can be easily connected or released by pulling the mechanism up and out. Gummy grip composition is comfortable and durable.Automatic Comfort TCS straps: adjust without the use of a buckle for convenience. 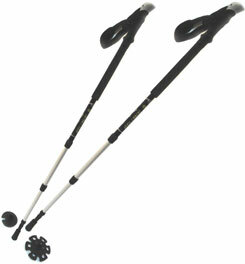 Easily released from the poles with a simple push button "click". Wrist straps are 1.25" wide with a neoprene lining for comfort.Foam Grip Extension: additional gripping area on upper shaft to handle switchbacks and abrupt changes in terrain easily.TPL-Top Locking System: developed through 50 years of manufacturing telescoping poles and continues to be one of the most reliable locking systems in the world with a hold of more then 150kg (330lbs)EXL-Easy Extra Locking System: the EXL, an expander with locking strength 40% higher than standard systems available in the market. 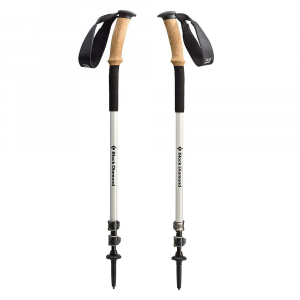 Perfect for ultralight products, it can be locked with just turning the tubes with the fingers minimizing the force need to adjust them.Carbide Flextips: concave, cylindrical tips offer secure hold on all terrain and surfaces; Carbide is extremely hard and durable; entire tip ferrule (Flextip) is replaceable. Interchangeable Basket System: baskets easily thread on and off; different size basket options allow poles to be customized for all seasons, all activities (trekking, snowshoe, backcountry touring, etc). Trekking Lite and SS Powder baskets included. The Gabel Tour Lite Lime is not available from the stores we monitor. It was last seen October 23, 2012	at Campmor.